Hurry on this one! Marked down from $22895 - you save $897. Hello. 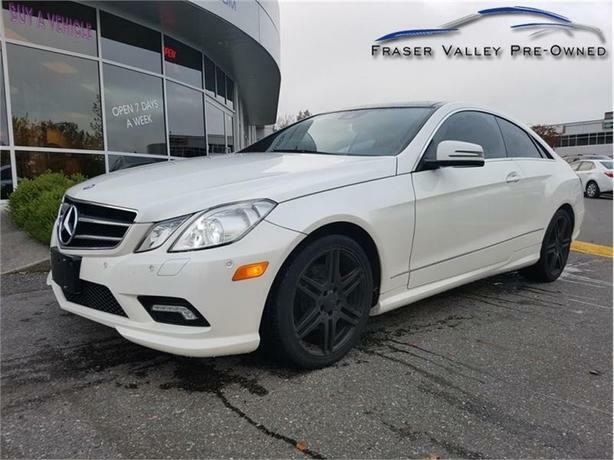 This 2011 Mercedes Benz E-Class is for sale today in Abbotsford. Enjoyable to drive, offering superior quality and available in a host of different body styles, the 2011 Mercedes-Benz E-Class is a luxury-car triumph that deserves serious consideration. For 2011, the E-Class adds a convertible to the lineup, and sees the return of the wagon body style and optional diesel-fueled V6 engine. There have also been minor exterior and interior upgrades, with the coupe getting new grille mesh, and all body styles getting restyled headlight control switches and relocated ESP controls.This coupe has 92713 kms. It's white in colour. It has a 7 speed auto transmission and is powered by a 268HP 3.5L V6 Cylinder Engine. Buy this vehicle now for the lowest bi-weekly payment of $194.61 with $0 down for 60 months @ 5.69% APR O.A.C. ( Plus applicable taxes - Plus applicable fees ). See dealer for details.